Carpenter bees build their homes in unfinished wood, which is why they can be particularly damaging to manmade structures. They bore into wood, creating one opening for a nest, and then tunnel throughout the structure creating instability for the building itself. Unlike termites, carpenter bees do not eat the wood; they simply remove it to create habitat. 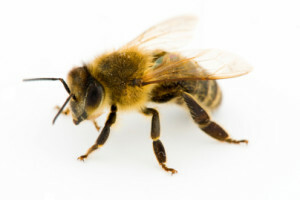 They are thought of as somewhat isolated bees, but females will often band together in small social groups, divide labor and support the offspring of a little colony. They live in nests from the prior year during cold months, emerging in April and May to begin reproducing. 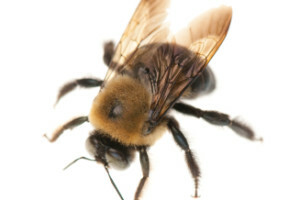 Carpenter bees compromise the integrity of wood structures, and because they return to previously built nests, it can take a couple of years to fully treat them. You’ll notice a problem easily, by identifying holes in your wooden property and during warmer months, you’ll see and hear the bees working in and around the nests. Strategic Industries has proven methods of treatment for carpenter bee problems, and we can help you develop a prevention and maintenance plan that will protect your assets for years to come after the pests are removed. The honey bee is a fascinating but often nuisance pest. Honey bees collaborate in colonies, workers and drones feeding the queen, larvae and pupae, as well as continuously adding onto and developing the waxy hive. Hives are usually located where they are reasonably protected from the weather and out of harm’s way, so you’ll sometimes find them in wall and ceiling voids. Because honey bees are important pollinators, currently suffering from widespread devastation, it isn’t recommended you try to remove them yourself or use dangerous chemicals. If left untreated, their colonies can become large and damaging to the structure of your building.